30 years back, in my pursuit to discard Astrology. I had to study this subject. When I dwell deeper into this ocean of divine knowledge, the deeper I went, rare gems were found sparkling with brilliance, inviting the mankind to pick them and use them for the benefit of the mankind. According to the Vedas and Purans, the tussle between the Devtas and the Asuras resulted in the great churning of the ocean, `SAGAR MANTHAN’. During the churning the ocean gifted various things to the manking, material and non-material. Among others, the science of medicine (Ayurveda) and Astrology (Jyotish) are the famous one. This is a mythological truth among Hindus. I will write a separate article whether it is myth or truth or both. Without going into the debate whether Astrology is a science or an Art or both normally people specially the intellectual kinds are seen saying that medicine is science but the same man of medicine if he is plastic surgeon, theoretically knowns plastic surgery but does not its application also, can he be able to treat the patient. Art is only applied knowledge. Until one knows the correct application of any knowledge it is of no use to the manking. So is with any knowledge. Reverting on the subject, in my search of truth/fact about astrology. I met scores of people in this regard, genius as well fake. Our ancients were great visionaries, and that is why the Astrologers were called DAVANGANA meaning those who can see, visualize the present, the past and the future far beyond the vision of the normal man. Ramayana and Mahabharata are the two greatest sacred epics of Hindus. Both the epics were written in the coded language. So are the Vedas. The common meaning of these are differeent as compared to the coded meanings. While Ramayana is kept at every house of Hindus it is forbidden to keep Mahabharata at home. Since the creation of the universe the two forces positive (+) and the negative (-) which are equal and opposite to each other keep on working and will always keep on working till the end of this universe. The man oscillates between these two and cycle is created. Take Electricity, current is created between the positive and the negative one. To use this, say to light the bulb both + and – phases are required. With a single phase positive or negative one the bulb will be lit up. The universe in order to survive always maintains a balance between the two forces, so is the case with the mankind. The man hankers between the good and the evil, one the force of goodness (+) the other being the force of evil (-). The fight for the supremacy between the positive and the negative always goes on whether it is in Kaliyuga or Satyuga or any other time frame. In Ramayana the positive force is represented by Ram whereas the negative one by Ravana, the king of Demons. In normal parlance it appears the fight for dominance of one king or the other. The cause of fight between the both is Sita. Now let us see who Ram, Ravana and Sita were. Ram is said to be the avtar of Vishnu, the operator of this world, representing the Devtas. On the other hand Ravana was representative of Demons the negative force. 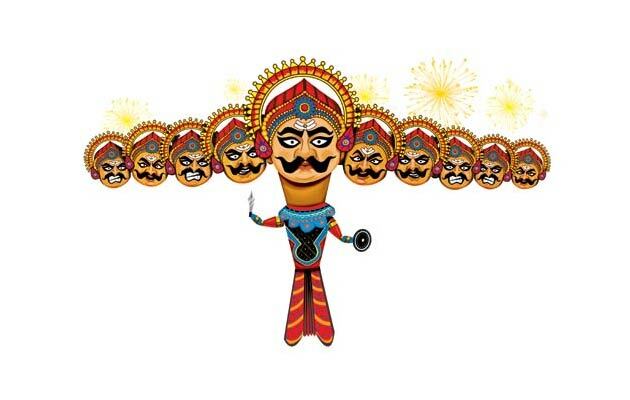 Ravana was said to be of 10 heads. Is it possible for human or demons to have 10 heads Ravana was called Dashanan, person having ten types of knowledges (Vidyas). Some of these were secretly held by Devtas. One of the branch of this knowledge is how to create life in our universe. All these appears to be fiction or myths, but seen in the right perspectives, these are not myth but bare facts the truth. Ravana was the greatest Genetic Engineer of all the times. The man has always strived for perfection in this science. From the time immemorial differnet people / rishis / man of science have tried to master this science of life. One of the great rishi Maharishi Vishvamitra was one such scientist who not only tried to create life on earth but also able to send living human to Swarga the another loka against the principles of life and death. Coconut tree and Sugarcane are supposed to be created by Vishvamitra. In Mahabharata also this technique was also tried and perfected by one of the medical rishi on Gandhari and Kunti. A separate article is required on the subject. Due to having 10 types of knowledges at his command Ravana became the most powerful asur on the earth. With the help of his knowledge of genetic engineering he tried to create life in this universe. For his experiment he required the purest of blood original, unadulterated, which was not contaminated and having pure RNA-DNA and Genes. Hindus particularly our Rishis were famous for having such blood flow through their veins. Today also the researchers in this so called modern science also require this unadulterated type of blood to carry on such experiments. In order to maintain the continous supply of such blood to his laboratroy King Ravana used to send his soliders to collect the blood from the Hindu Rishis by force. When these Rishis complained this to the Devtas, Devtas were scared that this secret science might be misused by the Demons. So these solders of Ravana used to take the blood supply forcibly from the Rishis and sent the same to Ravana for further use. It is because of this reason Ravana was also in famous as the greatest but he had no other alternative. Ravana was successful in his experiment of creation of life. Sita was his first creation. How great a scientist Ravana was, can be judged by the fact that he also created an alloy/metal which glittered like Gold, harder than Steel but when burnt used to become blac. Ravana built his kingdom with this metal. His kingdom was called the kingdom of Gold. When Hanuman burnt his kingdom it turned black. Was this plastic of some sort. Some day our modern scientist also will be able to invent such alloy. Now a question arises here that where was Ravana’s Genetic-Lab situated? He also knew that Devtas specially their king Indra would destroy his lab if every found by him. For this Ravana had found a secret place at Mithila, the kingdom of mightly king Janak. King Janak os powerful a king hat both Devta and the Rakshas used to adore him and respect him. King Janak never used to take sides either of Devtas or of rakshas. He was a mighty neutral king. In order to pressurize him to take their sides King Indra created a drought in the kingdom of Janak. Ultimately Janak succumbed to Indra’s pressure and agreed to cooperate with Devtas to destroy Ravan’s lab. Janak destroyed the lab of Ravana but till then Sita was born. King Janak who was issueless could not kill the beautiful child. The child was a masterpiece of Ravana’s successful experiment. He took the child with him, gave her the name Sita and adopted her. This is the reason that no where in the great Ramanayana the name of her father and the mother of Sita is mentioned because she was not a normal human as usually born out of cohabitation of male and female on the universe. Nor a clone or test tube baby not only this Ravana was the master of Aeronautics and the space sciences who could walk with ease in the space without any mechanical help like Aircraft or spaceship etc. This natal chart of Ravana was handed over to me by my Guru Pt. Radheyshyam Kasushik during a discussion though in different context. What immediately attracts student of astrology like me in the above chart is that the Sun the lord of lagna in lagna, lord of 12th in 12th, lord of 2nd in his own and the lord of tenth Venus in 10th itself. Four planets in their own houses. Two planets Saturn and Mars exalted that too in upachaya houses. Combination of lord of fifth and first, Sun and the Jupiter in lagna. All this made Ravana mighly and the majestic king. But above all placement of Rahu in Dhanu in the fifth hosue, the house of higher learnings, aspected by the mighty Jupiter from the first house made Ravana to master of such secret sciences and creator of life God. Readers may do well to campare this chart with the horoscope of king Rama who killed him. My efforts will be sufficiently rewarded if I am able to ignite the spark in the mind of modern intellectuals that our Rishis were great visionaries and masters of various sciences who strived hard continously to experiment and update different knowledges for the welfare of the mankind. Our Epics, Veda and Puranas are not mere fictions or stories, rather these sacred books written in the coded scientific language, language known to a very few on placed before the mankind for their welfare and contain the evil or negative forces. The scores of knowledges / Vidyas / Gyanam, still unknown to the human race if only we open our already biased mind and do some real reasearch work as the knowledge of our great masters is far superior than all the modern sciences and knowledges, and use these for the benefit of human race. My salute to this great master to whom we remember every year on Dashara day and the same time burn his effigy also.